The most fundamental element of putting together a great project team is the unambiguous and explicit commitment to the right team behaviors. Individuals can be in a team without putting aside their individuality. The more the group deviates from basic teaming principles, the more likely it will exhibit negative behaviors and outcomes. Therefore, we need to establish the team and commit to the team concept. The easiest place to see how teams work well and badly is in sports, particularly junior sports. Both of my kids played club soccer from the age of 5 to their mid-teens, so I watched a lot of kids’ soccer over the years and saw that the better the teamwork, the better the results. And the better people these kids turned out to be. Especially in their early years, it’s easy to see examples of anti-teaming behavior: players not holding their positions; players clustering around the ball; or players keeping possession and making individual runs for the goal instead of passing to better positioned players. As in sport, delivering projects successfully requires many people to work cohesively towards a common goal. But how do we get trained, professional specialists, who are already working and cooperating in a loose team formation, to take the next step into a more cohesive team structure? To achieve a team environment, we will face conflicting drivers for individual team members because they approach the project from the perspective of their individual skills and/or their departmental accountabilities. However, in order to give team goals the primary of place in their team-related activities, they must redirect those same skills and/or accountabilities. People who are involved in more than one team (i.e. in matrix structures), have a very high cognitive load. They suffer from high loads on context-switching as they move from team to team (often multiple times during the same day). It is inevitable that they are unable to maintain focus on one project, or become invested in one project’s outcomes. That is probably why the Agile community puts so much emphasis on dedicated teams. If your team members are not fully invested in the team, then at best, it becomes a committee. At worst, it is a group of individuals working in loose formation. 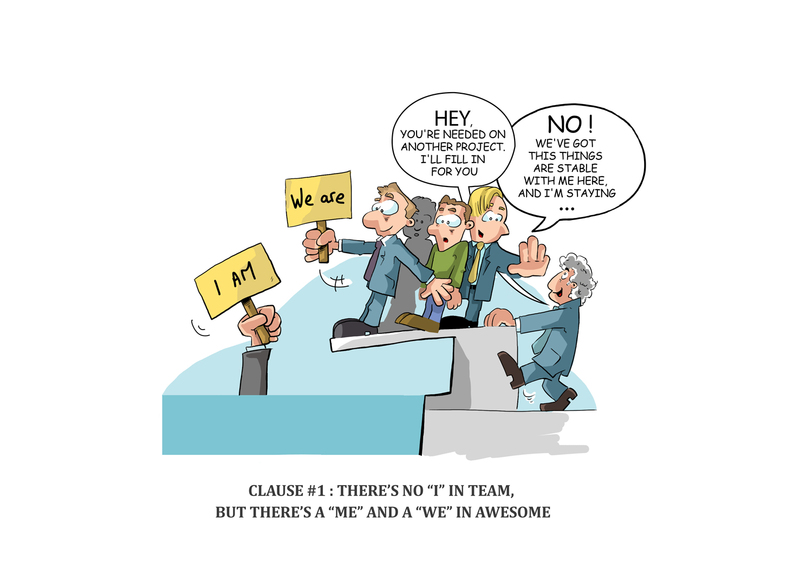 If you accept that teaming and teamwork are what we need to deliver projects, then we have to find a way to create a team within confining structures. The literature on team-building is vast, and not restricted to the area of project management. Clearly defined and shared goals, shared experiences such as overcoming an obstacle, training and leadership are all contributors to the evolution of a team spirit. The most obvious way to get people to commit to a team, is seeking an agreement on what a team means, and then ask them to commit to that definition. Preferably, this should be done explicitly and in a visible way. The signing of the Charter (or even just the process of reading and discussing the Charter) clearly sets expectations around how the project would run. It gives people the opportunity to agree or object to the clauses. They can ask questions and discuss definitions, boundaries exceptions. And this process forms an important early step in the formation of the team. By hammering out a modified version of the Charter, it builds a shared experience on subject matter of fundamental importance. This first clause is intended to define the primary meaning of joining the team, and to ensure that the individual clearly agrees with that concept. The remaining clauses are dependent on this first clause. I join this team willingly and freely. I know that the goals of the team cannot be achieved by one person. My skills, knowledge, experience and judgement will be amplified by that of my team-mates. Teams are strong because they are mutually-supportive and complementary. My emotional and personal capabilities are just as important as my technical or domain expertise. I can express my personal style within the framework of a mutually-supportive group. At the same time, I gain from the combined power of individuals working together. I am placing a part of my future in other team member’s hands; and equally that, they are placing a part of their future in mine. I respect and welcome that trust. I commit to discharging that trust fully and completely, and I trust that others in the team will do the same. I understand that I cannot succeed ethically if the team fails. Lastly, I recognise that I can achieve my own personal goals, such as reward and recognition, by ensuring the team’s success.